Today: A risotto made with one of Venice's best vegetables -- because bitter is better. This simple winter risotto marries two iconic ingredients from Italy's northeastern region of the Veneto. It's a classic dish made of rice and radicchio that's well-known throughout Italy, and for good reason. 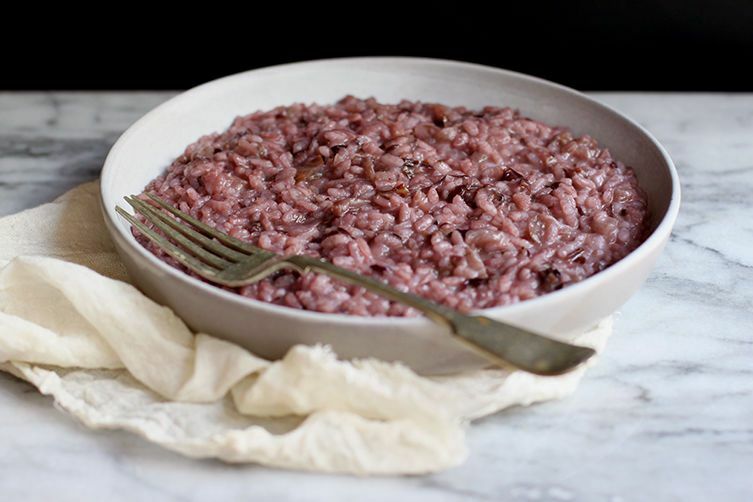 It's surprising how this dish's almost minimalist nature can result in such a flavorsome risotto, where the radicchio -- and the balance of its characteristically bitter flavors -- is what sings. More: An equally unembellished recipe where radicchio gets to shine. Radicchio is, as its name might give away, an Italian vegetable (pronounced ra-di-key-oh) -- a leafy chicory, stained deep maroon, that's bitter (but in a good way. Bitter is better, when it comes to health, anyway). It is a type of chicory that is as delicious raw in salads as it is roasted or grilled. Its varieties are named after their cities of origin. The most well-known are radicchio di Chioggia -- a round variety that's slightly less bitter than its relatives and comes from the town of Chioggia, just south of Venice -- and the radicchio di Treviso, an elongated variety from just north of Venice, which comes in two forms. The first, simply called Treviso, is an early-harvested version with long flat leaves, similar to a Belgian endive, and the second is the Tardivo, a highly prized, late-harvest version with beautiful, gently curled leaves that have large white veins that resemble fingers or tentacles. It's impressive. And delicious. Marcella Hazan calls it the most magnificent vegetable. 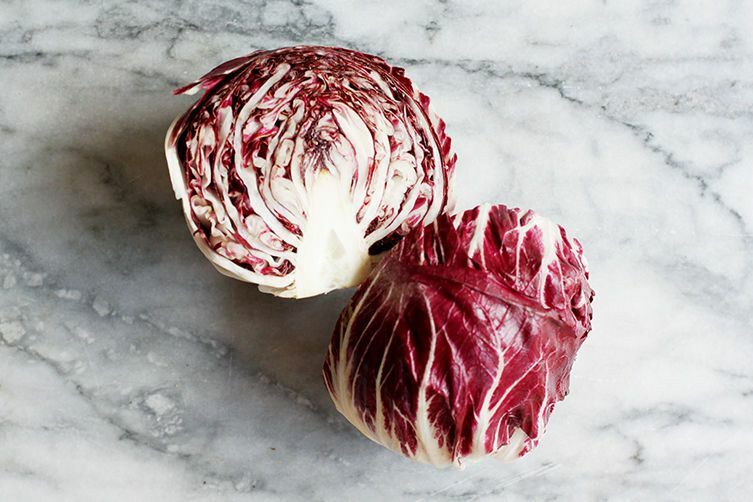 More: How to buy and store radicchio. This latter form of radicchio di Treviso, Tardivo, is by far the preferred type to use here, but outside of Italy it might be easier to find Chioggia or the early Treviso, which are also a little less bitter. As this risotto is all about the balancing act of flavors, take your radicchio into account when you make this recipe and adjust for bitterness accordingly. There are a couple of ways sweetness is brought into this classic Venetian risotto. One is through the use of onion, a decidedly sweet vegetable, or pancetta, with its salty-sweet tendency. You could also vary the onion by substituting leek or scallion. Red wine is another good addition, and one that I prefer to white, as it adds not only acidity but also matches that beautiful color of raw radicchio that the vegetable inevitably loses as it cooks. To help with the balance of flavors, you could go for a sweeter red wine here too, perhaps a Lambrusco Amabile or, for a local choice, Barbera. 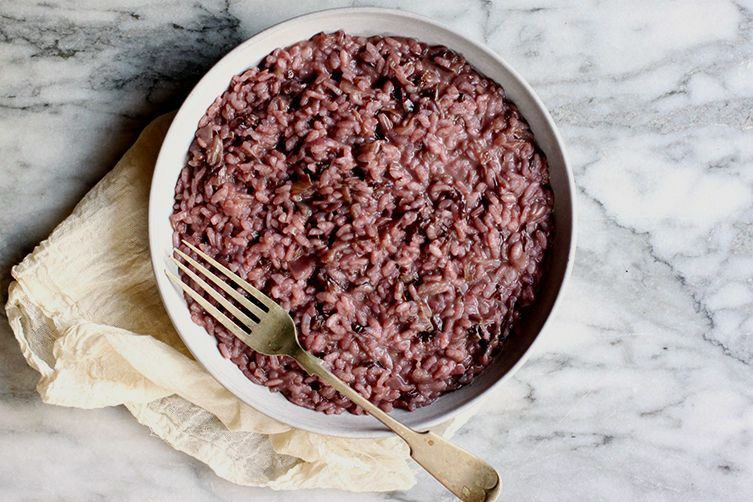 As with any starkly simple dish, use good ingredients to begin with: vialone nano rice -- a short-grain rice native to the Veneto that's arguably the best for making risotto -- and a succulent wine, one that you'll probably want to drink while eating this.